India didn't conform to any of the rules, not being a Dominion, but having some Dominion-like status (it was a member of the League of Nations) and not really being a colony either. Its flag was the Union Jack bearing the insignia of the Order of the Star of India. It had a Blue and Red Ensign, too. Until 1858 the British possessions in India were fiefdoms of the East India Company (EIC). In that year those territories passed to the Crown, who nevertheless continued to appoint a Governor-General of the whole as the EIC had done. In 1876, at Disraeli's behest, Queen Victoria adopted the title of Empress of India, and henceforth India became known officially as the "Indian Empire" with a Viceroy instead of a Governor-General. In theory, the large numbers of "Princely States" which made up 2/5 of the territory and 1/5 of the population (source: Whitaker's Almanac 1945) of the Indian Empire (the term "British India" was properly reserved for the territories under the British Crown) were independent, sovereign states. However, they all had treaties with the Crown that effectively made them protectorates, and events like the Delhi Durbar of 1910 emphasised the idea that the King-Emperor was suzerain over the whole sub-continent. As a digression, until just a few years ago it was possible to find 1948 shillings in one's change - the last British coins to have "IND. IMP." among the royal titles. That the Princely States had no real freedom was made plain at independence in 1947 when they were ordered to chose absorption into either India or Pakistan (the choice of the Hindu Ruler of mainly-Muslim Kashmir to opt for India is the cause of the tensions there that persist to this day). Only Hyderabad, the largest and most populous State, attempted to re-assert its independence and if I recall correctly it bowed to the inevitable and joined India in 1948. I believe all the States had flags, but don't know of any. Finally, India's special status was recognised within the British government too - from 1858 to 1947 India had its own its own department, the India Office, and Secretary of State, quite separate from the Colonial Office. The star of the Grand Commander of the Most Exalted Order of the Star of India, the highest class of the Star of India and the star that appears all over the place on British "colonial" flags in India. What I have given is just a line image. The Most Exalted Order of the Star of India was an Order of Chivalry instituted in 1861 and discontinued in 1947. My "Wonder Book of Empire" of 1920 has a colour plate of the arms. [The star of India] consists of a golden sunburst, on which is a light blue garter with the motto "Heaven's Light Our Guide", on which is a silver five-pointed star. These were the insignia and motto of the Order of the Star of India (inaugurated in 1861) and were chosen as being acceptable to all religious groups in India. I guess that the crown is the Tudor crown, which cropped up quite regularly surmounting or within the arms/disks on various flags. "The Most Exalted Order of the Star of India...The circlet of the order...is of light blue inscribed with the motto, "Heaven's light our guide." This in its turn is surrounded by the collar of the order, which is composed of alternate links of the Indian Lotus flower, crossed palm-branches, and the united red and white rose of England. In the centre of the collar is an Imperial crown from which depends the badge of the order, this being an onyx comeo of the effigy of her late Majesty Queen Victoria within the motto of the order, and surmounted by a star, the whole being richly jewelled. The surrounding of the shield by the circle of the order doubtless is a consequence and follows upon the original custom of the armorial use of the garter..."
Some versions have 26+26 rays with a greater difference between the length of the long and short rays so that the short rays have in total, a more circular outline with the long rays appearing to project out from the circumference of a circle. The rays and the star are yellow (gold? ), and the band and background to the star is pale blue (silver?). On the star there's a certain amount of irregular shading which tends to be concentrated to the left of the lines running from the centre to the points and to the right of the lines running from the centre to the indentations. 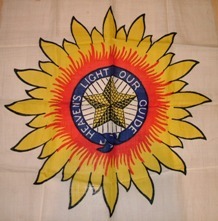 This photo is of an actual Star of India badge as used on flags. I was given this badge by Robin Ashburner (Flagmakers in Swansea, Wales) who makes historical flags and uses this badge for the colonial Indian flag. The detail here is not too dissimilar to that shown above. Viceroy and Governor General afloat in Indian Waters c1885 to 1947. Hoisted at main masthead. Hoisted at the foremasthead it indicated the presence of a subordinate Governor, Lieutenant- Governor, Chief Commissioner or Political Officer. Also hoisted at the fore by Political Resident Persian Gulf, or subordinate Political Officer within the limits of his jurisdiction, or on duty elsewhere. Ensign of Indian Marine 1879 to 1891. Ensign of Royal Indian Marine 1891 to 11 November 1928. Jack of Royal Indian Marine 1 November 1928 to 1934 (see previous jack). Jack of Royal Indian Navy 1934 to 1947. Between 1928 and independence in 1947, the Royal Indian Marine was allowed to fly the White Ensign of the Royal Navy (i.e. British White Ensign). The former Ensign was retained, but was then flown, when appropriate, as a Jack at the bow. In 1934 the Royal Indian Marine was re-named the Royal Indian Navy. No Admiralty Warrant was issued for this ensign which was an unofficial, or semi-official land flag. It was used between 1945 and 1947 in the context of India's membership of the United Nations, and possibly used earlier to denote India's membership of the League of Nations. The Star of India Blue Ensign did not become the Jack of the Royal Indian Marine until 11th November 1928. Before that date it had been the Ensign, and the Jack had been a Union Jack with a blue border one fifth the width of the flag. Since the whole flag was 1:2, the union jack presumably had proportions of 3:8. Sources: Admiralty Flags of All Nations; Navies of the Empire, F.E.Mcmurtrie; Naval and Maritime Flags of British India, A.Rowand; Colours of the Fleet, M. Farrow; Public Records Office document ADM 1/8726/128. Admiralty warrant, granted on 9th April 1884. The ensign of local naval vessels is a usual defaced blue ensign. The badge is a golden lion rampant guardant holding in front paws a crown. After 1904 the the Victorian blue ensign was replaced by the Tudor crown's introduction. 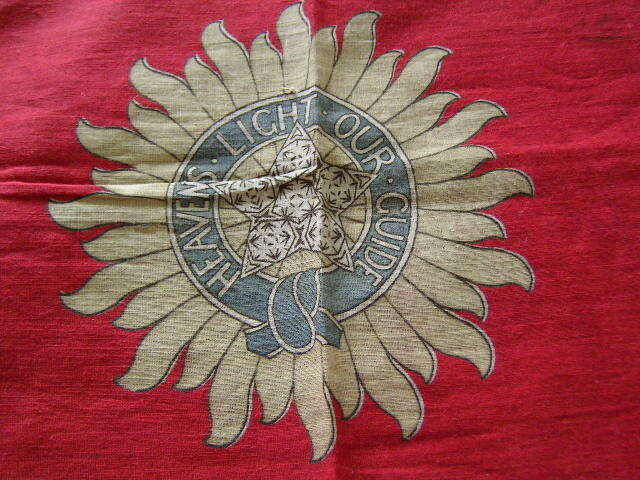 This was the ensign of Local Maritime Indian Governments. It was not a naval ensign, but the Indian equivalent of a colonial Blue Ensign as used on unarmed vessels. For example until 1937 when responsibility for Aden was transferred from the Government of India to the Colonial Office vessels of the Aden Port Trust had used this ensign. In 1880 a Blue Ensign defaced with the badge of the Port Trust of Bombay was sanctioned by the Admiralty. It was followed in 1883 by one for the Port Trust of Calcutta. At the suggestion of Rear Admiral Sir John Hext, the Government of India requested that these ensigns should be withdrawn, and proposed that there should be a general maritime ensign for Indian port or harbour authorities. The Admiralty issued a warrant, dated 9th April 1884, authorising "the Blue Ensign of Her Majesty's Fleet with the Lion Rampant Guardant holding a Crown (the crest of the Honourable East India Company) in the fly thereof. To distinguish vessels of any particular department, a triangular flag or pennant will be flown in bows, with the name inscribed thereon of the department to which vessel belongs or duty on which employed." CUSTOMS in white letters on blue. WATER POLICE in blue letters on white. MEDICAL in black letters on yellow. "Vessels of private bodies are to wear the Red Ensign with such distinguishing triangular flags as they decide upon." PILOT in red letters on white. PORT TRUST in white letters on red. The badge, used on the broad pennant and on the Blue Ensign (above), was the crest of the arms of the East India Company, known colloquially as the monkey and the coconut. The 1889 Admiralty flag book shows this device encompassed within a circle and presumably, this circle was drawn at 4/9 of the width of the blue ensign which would have been standard procedure at that time and indicated as such to give guidance to contemporary flag manufacturers. 1847. The Superintendent of the Indian Navy, was made Commander-in-Chief of the Indian Navy, and hoisted the broad pennant of a Commodore 1st Class of the Royal Navy on his flag ship in Bombay Harbour. His right to do this was disputed. 1848. 14th June. The Admiralty authorised a special broad pennant, Commodore 1st Class Indian Navy, for the use of the Commander-in-Chief Indian Navy. The Commander of the Persian Gulf Squadron, who assumed the rank of Commodore 2nd Class, had a similar broad pennant in blue. Both pennants went out of use in 1863 when the Indian Navy was disbanded. 1877. The Bengal Marine and the Bombay Marine, which had each been concerned only with transport, surveying and pilotage, were amalgamated, armed, and given the title Her Majesty's Indian Marine. 1879. 2nd July. Admiralty Letter authorised Blue Ensign defaced with the Star of India as the ensign of H.M. Indian Marine. 1884. 21st April. Admiralty Warrant authorised blue bordered Union Jack as the Jack of H.M. Indian Marine. At the same time a Warrant, replacing the letter of 2nd July 1879, confirmed the Blue Ensign defaced with the Star of India as the ensign of the Marine. 1892. Name changed to Royal Indian Marine. 1909. 13th April. Broad Blue Pennant (no St. George's cross) defaced with Star of India introduced as Senior Officer's Pennant. Worn only in port when in company with other vessels of the Royal Indian Marine. Also worn by Port Officers in the Mercantile Marine Department. 1921. The Broad Red Pennant that had been discontinued in 1863 was resurrected as the flag of the Director of the Royal Indian Marine. 1928. 11th November. The White Ensign of the Royal Navy became the ensign of the Royal Indian Marine. Its former ensign, Blue Ensign defaced with the Star of India, replaced the blue bordered Union Jack as its Jack. The Broad Red Pennant was retained, but only for special occasions. 1934. Renamed Royal Indian Navy. 1947. 15th August. Split into Indian Navy with National Flag of India as the Jack, and Royal Pakistan Navy with National Flag of Pakistan as the Jack. 1950. 26th January. India became a republic and Indian Navy Ensign replaced White Ensign. 1956. 23rd March. Pakistan became a republic and Pakistan Navy Ensign replaced White Ensign. Also listed as Commodore 1st class of the Indian Navy 1848 - 1904. The standard of the Director of the Indian Navy when aboard Indian Navy ships is a red swallow-tailed broad pennant with a yellow cross and badge, a golden lion rampant guardant holding in front paws a crown, in canton. The flag was perhaps introduced in about 1942 ? Added to the 1930 edition of the Admiralty Flag Book on 20 February 1945; plate 22c. The image here has been made from a description of the ensign, so the size and style of the swords, and the size of the Star of India may not be accurate. It was noted on 22 December 1948 that the flag no longer existed.